I’ve literally had nothing worth blogging about since I didn’t go to Hellfest. I am still gutted about that but I realise that I made the right decision in not going. God knows what damage I would have done to myself if I had gone. Just trying to think what has gone on since the last post. England got knocked out of Euro 2012. I said (on some form of social media I think) that having confidence when it comes to the England football team is dangerous and yet I found myself believing they might be able to finish in a respectable position. To be fair, they did. I don’t think anyone really thought they would make the last 8, so they fact they did is a good result. I’m not having a pop at Roy Hodgson by saying that people didn’t expect them to make the last 8 – but with all the turmoil surrounding the job since Fabio Capello walked in Feb (?) meant anyone would have found it tough. Oh well, time to look towards World Cup 2014. I think it would help England and England fans though a lot if we just admitted that we aren’t world beaters. We are not on the same level as Spain, Brazil, Holland, Germany, Italy, Argentina etc. If we beat any of those teams, then we have done well but across the board, they are better. How FIFA can suggest England is 4th best in the world is really beyond me. I’m sure it’s done by games won, goals scored etc – but when you are up and around the top, shouldn’t you have to beat the teams around you to go up in the rankings? Ah well. Speaking of FIFA, apparently soon, goal-line technology is coming in to the game. It is almost as if FIFA have just seen a calendar and realised it is the 21st century. I still maintain that a TMO, similar to Rugby Union would be better than goal-line technology but oh well – baby steps people! Staying on the theme of sport (rugby this time), the local nations really didn’t do amazingly well in their summer tests did they? Kudos goes to Scotland for winning all 3 of their games (including a historic victory against Australia) but aside from them, it wasn’t the best. I am optimistic about England’s future as it was a young squad that went out to South Africa and they didn’t embarrass themselves. I believe they will have learned a lot from this tour and will head into the autumn internationals better prepared than they otherwise would have been. I am slightly perturbed that you still cannot get tickets for those England internationals other than Fiji, but I don’t know if I could afford tickets anyway. I wanted to just pass comment on the final game between Ireland and New Zealand...damn! The All Blacks won 60-0. They were immense. I don’t think Ireland was that bad, I think it was more of a case of NZ being just that damn good. Some of the moves to make tries were truly sublime and an absolute joy to watch (well, an absolute joy as a neutral in the moment, I imagine if it was my team being crushed, my views might be slightly different). I didn’t set out when writing this blog to dedicate the first 700+ words to sport, but it just flowed – and so shall it continue with more talk about sport – this time tennis and of course, the success thus far of Andy Murray. He has looked really good going through the various rounds of Wimbledon and yesterday made the final. He is the first British male to make the singles Wimbledon final since 1938 I believe. Interestingly, last time a British player won a solo final was Virginia Wade in 1977 – the Silver Jubilee year for Queen Elizabeth II. 35 years on, it is the Diamond Jubilee year for Queen Elizabeth II and another Brit, this time Andy Murray has made the final. He will face Roger Federer who has made history by being the only person (I think) to make 8 Wimbledon finals. It will be a very interesting game to watch and I hope that Andy Murray will win. But I will be proud of the British Number One, regardless of the result. He has done really very well to get to the final, hell he did well to get to the semi finals and that is worth praising. There is something which concerns me again at this stage of Andy Murray’s Wimbledon run, and that is the media and generally the man on the street’s opinion of Murray. The Jeremy Vine show from Friday highlighted this opinion by having a woman as a guest on the show (not even a call-in) saying how she dislikes Murray. That is allowed – but this woman then admitted to not liking tennis. That to me makes her opinion on Murray null and void, but other callers expressed a sentiment which to me is so short sighted. I read some tweets from Piers Morgan (a man who usually I have no time for) and I found myself in complete agreement. These are the tweets I agreed with. Absolutely! Winning any tournament, but especially one like Wimbledon requires you to be a superb player. He won’t be stripped of the championship (assuming he wins it) because he lacks in the charisma department. It is completely pathetic that people are saying anything other than praise for Andy Murray. I know this will be written off as a “typical British response” but why is that the typical response? We should be so happy we have a British finalist! I am delighted for Murray personally, and I find it sad that tennis fans aren’t because of the part of the United Kingdom Murray originated from. This is the point I particularly agree with. 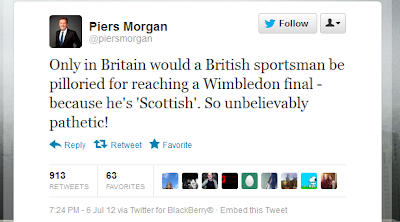 Andy Murray is British. Andy Murray is a part of Team GB for the Olympics (I assume anyway). He does not reject the title of British Number One. He was born in Scotland and like most Scottish people, does not support England. Whoop-de-doo! He isn’t the first Scot to think that way; he certainly won’t be the last. If Murray is playing an English player, then all of the anti-Scottish, anti-Murray people can support the English player and call Murray all sorts of Scottish related insults. When he is representing Great Britain though, you should back him. I fully expect to have the fact I don’t support Chelsea and Man City in European football thrown back in my face now. There is one significant difference to the two scenarios (apart from the sport!) and that is my dislike of them is not on national grounds. I believe they have spent crazy amounts of money to buy the various tournaments, thus not making them competitive and fair. TL;DR – Murray is British. What does the fact that Murray doesn’t smile, or have a fantastic public personality have to do with his ability to win at tennis? He is in the media as a consequence of being GB’s number one tennis player. He may not have superb charisma – but that does not mean a thing to me. If he wins every match, and never gives an interview – I’d honestly be fine with that. Performance first. 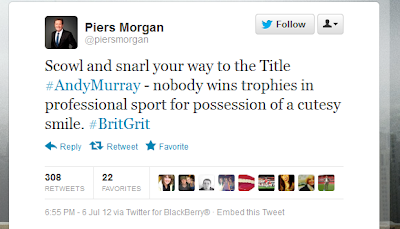 Fair play to Piers Morgan, usually I don't see him as the voice of reason but on this issue, I do. I didn't set out to write a whole blog about sports, but there we are. These things occasionally happen. I imagine this blog will turn into a little monster now if I add the bit I was going to write about gigs on the end of this - so I will make that a separate blog.